Yes it's already the beginning of another month and, yep I'm about to say the probably most common phrase ever, I can't believe how quickly time is passing by! I still feel like the beginning of the new year was just a few days ago. 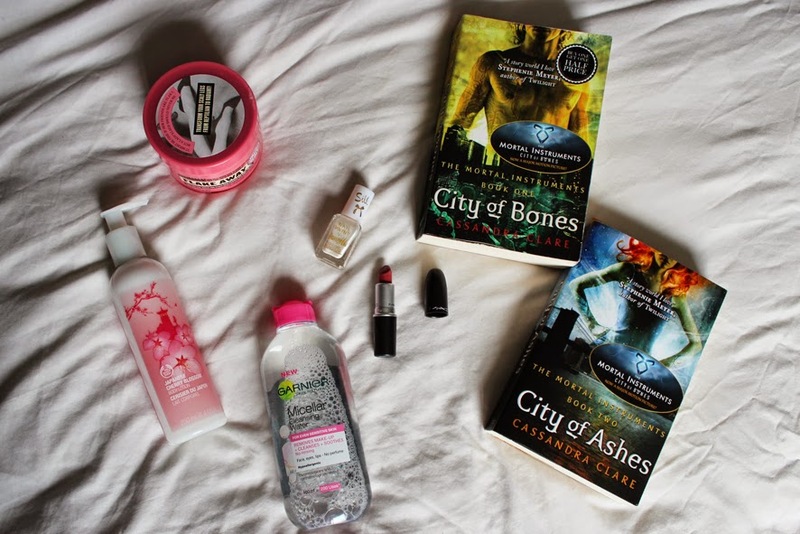 But oh well… Let's get into my list of March Favourites! Another product I really enjoyed (I'm actually still enjoying it as it's not empty yet!) is the Japanese Cherry Blossom Body Lotion from The Body Shop. I bought this back in december, but haven't used it up until now because I had to finish some other products first. It's such a lovely flowery scent which I think is perfect for spring. I also like the fact that it sinks into your skin quickly and leaves it super moisturized. I hate when I'm sticky and need to wait ages for lotions to sink in. So a big plus for that! The Soap & Glory Flake Away Body scrub is the next product on my list. A delicious peachy sugary sweet smell combined with a great exfoliating scrub for dry skin. 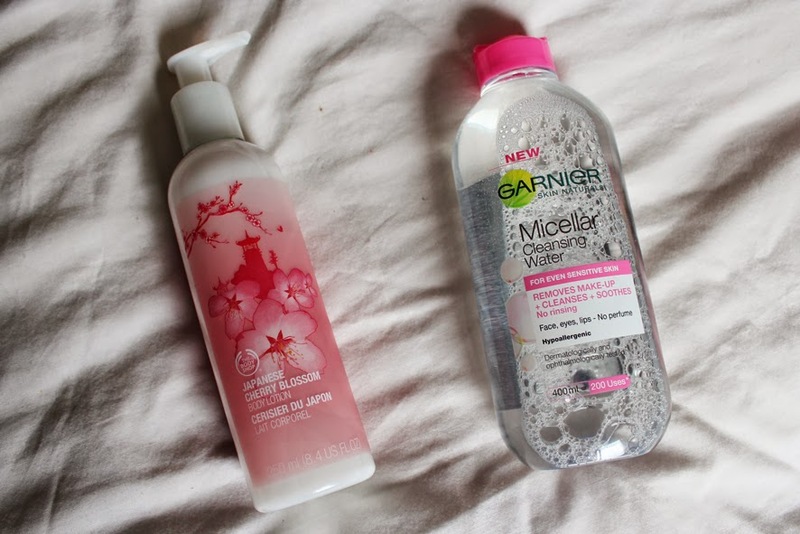 I've used it once or twice a week to get rid of dry skin (and also some fake tan). After using it in the shower I felt like it already moisturized my skin a bit - so it's definitely not drying out! On my nails I've been loving the Barry M Silk Collection Nail Paint in the shade Pearl. It's a gorgeous white pearl shade with a sheen matte finish. 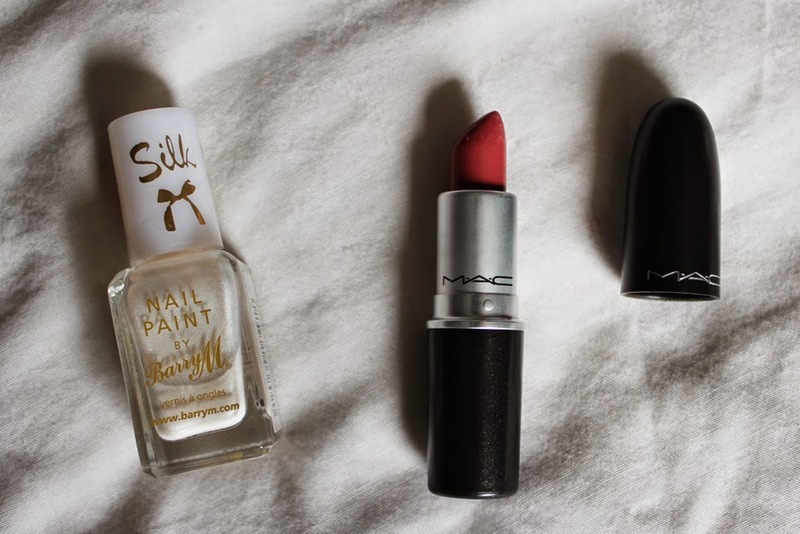 I've been looking for a colour like this for a long time and that's why I've been wearing it nearly non-stop! And a product I "rediscovered" in my make up stash is my "Cosmo" lipstick from MAC Cosmetics. I got this beauty as a christmas present from a friend and I actually have no idea how it ended up nearly forgotten in my make up box - never again! It's a lipstick with an amplified creme finish, a beautiful "your-lips-but-better" shade and therefor a great everyday lipstick! And also my very first ever MAC product - SHOCK! I might do a proper review on this one - would you like to see that? 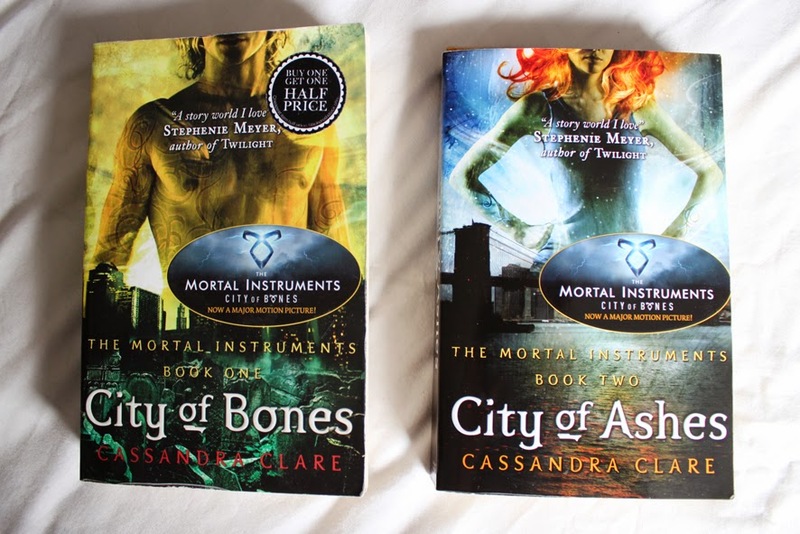 First of I've got a book, or better a book series that I've been loving: Cassandra Clare's "City Of Bones" and "City of Ashes" from "The Mortal Instruments" series. It's a young-adult fantasy book series set in New York. The main character is 15-year old Clary Fray who finds out that she's not as ordinary as she thought she was. She actually is a descendant of a line of Shadowhunters, who battle against demons to keep the world save and protected. When her mother disappears she joins other Shadowhunters to find her and bring her back. She finds out that there's also a hidden world called Downworld where demons, vampires, warlocks, werewolfs and other creatures exist! I know it's probably not everybody's taste but I'm really hooked on the books and already stocked up on the following books so I don't have to stop reading! At first I actually thought I wouldn't enjoy them, but I gave it a go and love them - so why don't you give them a read as well? They also made a film about it that I need to watch! I also listed to one band (nearly excessively haha) this month, the band being "The Kooks"! My friend introduced me to their music at the beginning of the month and since then I've been listening to their albums. They're a band from Brighton, which got me even more excited, as I'm going to Brighton this weekend - eek! I've never been before and I'm really looking forward to it and I know The Kooks will definitely be on my car playlist! Those are all my March Favourites wrapped up! I hope you enjoyed reading! I'd love to know what some of your march favourites were! And do you have some music recommendations for me? I'd love to get into some new bands or artists! Please leave me a comment below! Oh my God, I love the Mortal instruments! I fell in love with Jace. He's such an amazing character! Ahhh! I'm currently reading the 4th book and it's sooo good. :) I think the film is not as good as the book series, but Jamie Campbell Bower definitely made it worth watching! I just started the third book today - no spoilers please! haha Yes I love his character as well! I know I heard it isn't the best film but I'm going to watch it anyways haha I also heard their doing the second book as a movie soon? Yes I'll check it out now!